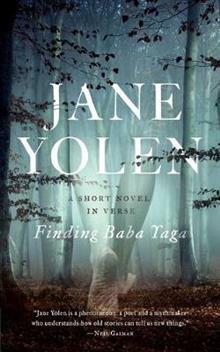 Jane Yolen is a phenomenon: a poet and a mythmaker, who understands how old stories can tell us new things. We are lucky to have her. --Neil Gaiman A young woman discovers the power to speak up and take control of her fate--a theme that has never been more timely than it is now... You think you know this story. You do not. A harsh, controlling father. A quiescent mother. A house that feels like anything but ahome. Natasha gathers the strength to leave, and comes upon a little house in the wood: A house that walks about on chicken feet and is inhabited by a fairy tale witch. In finding Baba Yaga, Natasha finds her voice, her power, herself.... A mythic yet timely novel-in-verse by the beloved and prolific author and poet Jane Yolen, the Hans Christian Andersen of America. Jane Yolen is a bestselling, beloved, and immensely prolific author of more than 365 books for children, teens, and adults, including the picture book How Do Dinosaurs Say Goodnight? and the novels The Devil's Arithmetic and Briar Rose. She is also a poet, a teacher of writing and literature, and a reviewer of children's literature. She has been called the Hans Christian Andersen of America (by Newsweek) and the Aesop of the 20th century (by the New York Times).